Let’s face it, we love this materialism we’re wrapped up into: the word has given ‘imitation’ a new meaning, allowing it to acquire additional shades of fat, as in counterfeiting, infringement, mischief, and caricature. From the time of the Renaissance, both God and Western civilization’s collective ego had begun to take some serious hits. But, alas, with all maps filled, whoever hoped for explorers? We love our computers – we love our Internet, our Google, our Skype. So whether we wind up merging with the machine as Kurzweil predicts, it’s hard to deny this trajectory of technology. On the other hand, we’re still afraid of death and we still fight it. In other words, the intruder belief system of knowing that somehow consciousness survives and the way our society is run are in conflict. There’s no question about that. Our industries, for instance our stay-healthy industries and beauty, anti-aging industries are all geared towards stopping that moment or delaying that moment of transition as long as possible. If we really allowed our intuitive beliefs of survival of consciousness to come into our society, a lot of this would change. But we don’t. We keep them compartmentalized. We eagerly keep ourselves in what I would call ‘the zone of imagination.’ We think we believe in it but we really don’t invest anything in it. We won’t, for instance, try to communicate with those who are already in that non-local reality of non-physical dimensions. On the opposite hand, it is no small thing to be a monster or a spiteful nitwit, and in the first case to think oneself gorgeous, in the second a highly intelligent person. Such characters must be represented. Someone has to do it. These dignified professions should be protected from extinction by UNESCO. We know that their adventures are childish. They themselves are fools. They are ready to kill or be killed over a card game in which an opponent – or they themselves – is cheating. Yet, thanks to such characters, tragedies are still possible. I stand here in the middle of the desert, as delusional as brother Moses once was, to tell you the essence of our world morphing. For the foreseeable future at least, we are enduring an aggressive fusion, we are herding in the middle, circling our worn out, weather-beaten wagons. We are like chameleons, we take our hue and the color of our moral character from those who are around us. I cannot remember – not for the lack of memory or galloping dementia – the last time I experienced an excruciating pain. Maybe twenty-three years ago during our emigrational family flight from Belgrade to Los Angeles, when a torturous toothache spoiled this trip of a lifetime for me. I cannot call to mind any recent overpowering joy electrifying my atoms either. The tiniest discomfort reaches for Advil, an arousing of bliss has to rethink itself on the spot. I read an article about a traffic jam in Munich, when a fella readily admits he still aimed for the mess with plenty alternative routes available. Sounds familiar? It attracted him as a human electromagnet, he said. In other words, outer circumstances call for us to write in a way everyone can understand; and if, in the toils of passion, we do something incomprehensible – good luck and good night. In a word, under no circumstance can one be hungry and dreamy. It was a comfortable profession for Updike and Vonnegut to sell cars back then when business was booming. Laydowns galore, all they needed to do was engage their natural charm and the immense bullshitting power natural to any scribe. No mas. Ignorants learn exotic words like invoice, hold back, flooring, so they come waving with them; clandestine illiteracy is epidemic: the less they know, the more proud of it they are. Generally amusing, the fun stops when you turn around short three hundred bucks of eleven hundred rent. It was an honorable job when writers were selling cars – that is if only I could abstract away from those imperishable ten-hour days of standing in the finest stupor wearing my best Sunday clothes in front of the various car dealerships; a paltry buffer in between the wimpy customers and the mighty management, inter faeces et urinam. Now I’m the only one left, and I don’t even know if you could call me a writer. In the meantime we managed to lose both professions. The Turks used to ride on the Serbian gravel for centuries; rampant, arrogant, fearless. What a sight that was! Then they stopped. After a while the roads grew anxious, itching, used to Turkish rub. But there were Turks no more. Where Vonnegut, Updike, and others moved on, I stayed; the great stampede somehow bypassed me minuscule in the dust. An impractical man – which I not only seems to be but really am – will always be unreliable and unpredictable in his dealings with others. He will engage in actions that mean something else to him than to others, but he is at peace with himself about everything as long as he can make it all come together in a fine idea. And what idea that is, leaving my own self there to rot. But then, there is no surer sign of greatness than ignoring hurtful or insulting expressions by attributing them without further ado. A book can never be anything more than the impress of its author’s thoughts; and the value of these will lie either in the matter about which he has thought – which I doubt and challenge – or in the form which his thoughts take. In the end everyone stands alone, like a novel’s end, and the decisive question is who he is that stands alone. I think if you were Satan and you were setting around trying to think up something that would just bring the human race to its knees, what you would probably come up with is the entertainment. With or without a sarcastic hue, it is an ideal weapon of watering down all the senses. The very first thing I happily noticed when they took me into the emergency room the other day was a high definition widescreen featuring top mass market bestsellers by Publishers Weekly, crowned by Steel’s Friends Forever. Just the title itself reminisces the Forest Lawn Cemetery as its shiniest pearl. Touched, I chose to die in comfort rather than fight for survival through the unbearable pain: the agony of the devoured animal is always far greater than the pleasure of the devourer. I was dead on arrival, a corpse with strong vital signs. Yet, sacrificing all your human traits comes with occasional perks, so the modern medicine did the fighting for me. Have no fear, paramedics are just feet away; they are looking at you as we speak, kid, in their hands a shiny duster covering the book signed by Steel herself. For only then, after the last trait is immobilized and forgotten, will amusement enter your thought system as an integral part and a living member, become perfectly and firmly consistent with it and in accord with all its other consequences and conclusions; it will bear the hue, color and stamp of your whole manner of thinking. Thus it will stay firmly and forever friendly lodged in your mind. The intellectual attainments of a man who thinks for himself resemble a masterful painting in a hushed dungeon, where the light and shade are correct, the tone sustained, the color perfectly harmonized; it is true to life in a dungeon. On the other hand, the intellectual feats of the mere fun-loving man are like a large palette, full of all sorts of colors, which at most are systematically arranged, but devoid of harmony, connection and meaning; and silence. Plain and simple. I have long held the opinion that the amount of noise that anyone can bear undisturbed stands in inverse proportion to his mental capacity and therefore be regarded as a pretty fair measure of it. Extraordinary claims require extraordinary evidence. If you wish to write from scratch, you must first invent the universe. The job of the writer is to perpetually deepen the mystery of that universe, not to untie the plot’s knot, what’s hot, and what not. Remember: better to write for yourself and have no public, than write for public and have no self. One still might dig you out one fine Wyoming dawn while bulldozing a hole to bury the fools. As for my taste, the most originality a writer can honestly achieve is to steal with an exquisite judgment. Everything belongs to the inspired and dedicated thief. Words, colors, light, sounds, stone, wood, bronze, belong to the living artist. They belong to anyone who can use them. Loot the Musil establishment! A bas l’originalité, the sterile and assertive ego that imprisons us as it creates. We are not responsible. Steal anything in sight and hope to get caught. I’ll take the risk of sounding low-priced, but the only time I actually quoted the source, in one of my early stories, three editors of a fiction site attacked me in sink, accusing me of plagiarism. I guess that’s how they knew. It is most embarrassing for a writer to have to point out such things himself. Dostoevsky’s The Double is his best work though an obvious and shameless imitation of Gogol’s Nose. I come to heist from Caesar, not to praise him; he did enough himself. Listen to what my favorite literary gendarme, Pliny the Elder, had to say live on YouTube, albeit within clearly more literate environment: ‘In comparing various authors with one another, I have discovered that some of the gravest and latest writers have transcribed, word for word, from former works, without making acknowledgment.’ Cry beloved belles-lettres! Taken from the altered angle, writing is an occupation in which you have to keep proving your talent to people who have none, then end up being passionately punished for it. As if there are innocent readers – what are they doing here in the first place?! People read in order to confirm what they already have in their heads and so they fail to see what is in front of them. Writing is not viewed as a serious chagrin, rather a place of strange, bizarre and illogical occurrences where we can afford not to do what common sense demands otherwise. Most readers will never understand the guises that cannot ever occur with any precision. They are too colossal and too imposing to be contained in mere facts. They are merely trying to occur, they are checking whether the ground of reality can carry them. And they quickly withdraw, fearing to lose their integrity in the frailty of realization. ‘Forget the man, is he any good as a writer – I would doubt so. Just don’t be polite where politeness is rude, Danilo.’ My smile had all the full-fledged arrogance of a 25-year-old who wrote a few stories and published none. 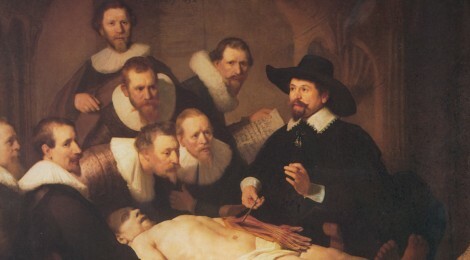 We sat for an hour, discussing the reaction to his The Anatomy Lesson – a book-essay about writing and politics in the Balkans, its title inspired by Rembrandt’s 1632 oil The Anatomy Lesson of Professor Nicolaes Tulp. Similar to Danilo’s sensibility, those Dutch masters had hardly any imagination or fantasy, but their good taste and their scientific knowledge of composition were enormous. Then I departed, leaving Kundera to his calvados trance. There have been so many interpretations of this story since its introduction in 1985. Even Kundera had his say about the snoring episode at one point – a benevolent comment indeed. I write this with a drawl straight off the pages of Faulkner.